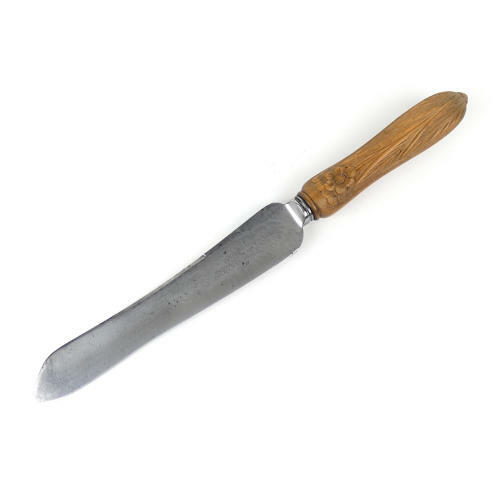 A steel breadknife with a carved wooden handle. The handle is very well carved with flowers and foliage. The carving is deep and very well detailed . The steel blade bears a manufacturers mark ‘ENCORE THOMAS TURNER & CO CUTLER TO HIS MAJESTY’. To the opposite side of the blade it is marked ’TURNER’S ENCORE’. It dates from c.1910. It is in excellent condition and the blade is still very sharp. Dimensions: Length 31.8cm. Width of blade 3.3cm Diameter of handle 3cm. Price includes postage within the U.K. Shipping to the U.S.A. add £10. Western Europe add £5.